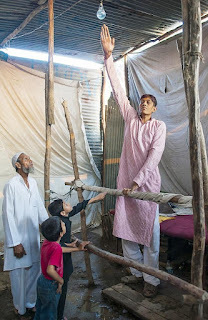 Meet Mr Darmendra Singh, born on 1982 who is India's tallest man with a height of 8 feet 1 inch ( 8' 1" ). He is 2 inches shorter than worlds tallest man Sultan Kösen of Turkey who measured 251 cm (8 ft 3 in), who was born in 1982 in Ankara. Dharmendra, holds a Master’s degree in Hindi, say his height poses some real problems for him. He was not able to find any jobs according to his qualification. He said, Whenever he went for job interviews , people asked how will he do the work since he is very tall. Currently he works in a local amusement park as a freak show performer. He get a monthly salary of Rs 10000 and also receives some tips for taking pictures with him. Dharmendra’s family are of normal height. His maternal grand father has height of 2.2 meters (7 foot 3 inches).